See more of Sean Kenney's amazing Lego artwork here! Wow! I could never build that!!! Just imagine how long that must have taken to build! Holy *insert expletive here* !! That is sooooo cool! And I dont ever really like legos....but i like seeing what other people have built. Remember when you mentioned earlier that you were planning to take kick boxing lessons? It sounds interesting; where are you planning to do so? I'd love to do that as well, but I'm already doing fencing, and although it does help to walk down the street while carrying a long weapon [haha], I think that some sort of martial arts would be more practical, because you're meant to be able to protect yourself if somebody starts punching you. COOOOOOOOOOOOLLLLLLL!!! I am such a sucker for this stuff! Jin Ai: I do fencing too. xD I know what you mean about the impracticality. Besides, foils are blunt so they can only bruise and.. um.. jab. But, I also do ji do kwan, which is a type of martial arts. :) Fun! Oh, and about this post: ahem... awesomeeeeeeee. I took fencing in 4th grade. It was really fun. Hey, had anyone been to Legoland???? ive never been but my mum has been to the one thats in Denmark when she was a kid. She said it was really cool!!! 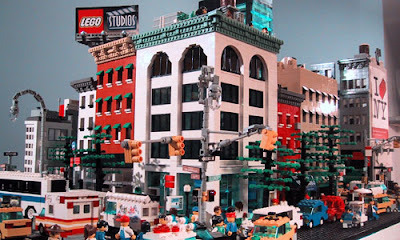 The lego city is really cool. I built a really big castle/fort thing that I could hide in once when I was around four. It was fun but it took up most of the living room so it ended up being taken apart. Hey Jin Ai, fencing sounds cool. I've never taken fencing lessons but I do study Keichu-Do, which is a form of Martial Arts (American, invented in the 40's, it's like a mixture of Judo, Karate, and a few other Martial Arts). Jin Ai: At Crunch. I've got a trainer there. But I highly recommend karate. There's a really fabulous dojo on twenty-third and sixth. If you're interested, I'll dig up the name. I used to take classes there until I got a little overzealous and hurt my wrist. Oh I saw this at LegoLand. The Structure is AMAZING!